For those who want to enhance their overall appearance, one of the most impactful improvements is seeking cosmetic dental care. As a cosmetic restoration, porcelain veneers can easily give our patients the beautiful smiles they want. MJ Waroich, DDS offers porcelain veneers to Georgetown, Dupont Circle, Capitol Hill, and the surrounding D.C. communities. Cosmetic dental treatments provide an effective and long-lasting boost to many people’s self-confidence. However, the challenge is to find the precise cosmetic treatment for each person’s unique need. Teeth whitening and composite bonding offer solely aesthetic benefits, but they lack the flexibility to treat broader reshaping and brightening cases, respectively. Porcelain veneers offer a purely cosmetic solution that can be customized to address several unique needs at once. Every treatment with veneers at our D.C. dental practice begins with try-ins. These sample prosthetics come in a variety of shapes and shades in order to determine which specific type of veneer will work best for you. After looking at the way the color and dimensions of the tester matches the rest of your smile, you and Dr. Waroich can discuss the most appropriate form of treatment. Once you have chosen the type of veneer you want, Dr. Waroich ships out the designs of your prosthetics to a dental laboratory she knows and trusts. The staff at the laboratory, using their unique experience in designing porcelain restorations, creates the veneers that will be added to your smile. They make sure the prosthetics are thin and durable enough to permanently look and feel natural; the fabrication process is not finished until they are sure your veneers will fit your teeth comfortably. Once fabrication is complete, the lab ships the veneers back to Dr. Waroich. She then goes through a quick test fitting to make sure that each prosthetic is truly as comfortable and aesthetically pleasing as possible. Unless any touch-ups are required, the veneer is then permanently added to your smile. 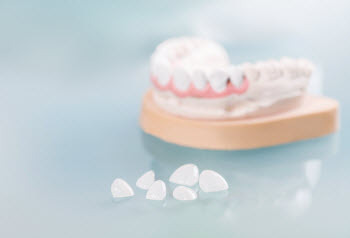 MJ Waroich DDS provides porcelain veneers throughout Washington, D.C. If you live in or near Georgetown and want to bolster the appearance of your smile, call us today and schedule your next dental appointment! We look forward to helping you meet your cosmetic goals.